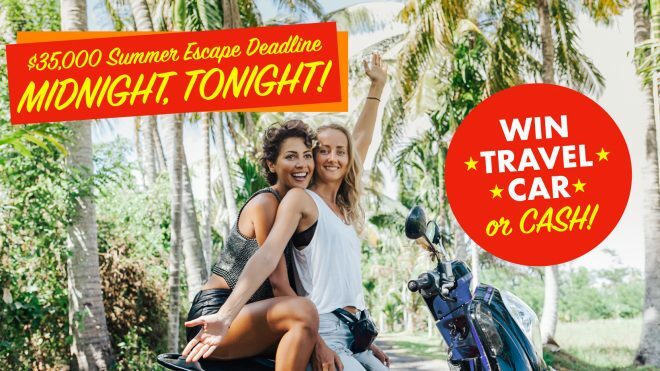 Attention, BC: Summer Escape Deadline - Midnight, Tonight! You are here: Home > Attention, BC: Summer Escape Deadline – Midnight, Tonight! Published on June 8, 2018 at 12:00 am . Vancouver, BC, June 8, 2018 — This is your year to become a multi-millionaire! Order your Hometown Heroes Lottery tickets today, and you’re automatically entered into the $35,000 Summer Escape bonus draw! Win a 19-day Trip to the South of France, plus a Paris/Barcelona cruise – and $5,000 cash to spend as you please. Or, choose the new car instead – a 2018 Honda CRV. Or choose $26,000 tax-free cash! You choose your cruise – whether it’s cruising through Europe in style, or cruising the streets in a brand-new car. Order today, and you’re in! Your tickets will automatically be entered into the massive Early Bird Draw – with a top prize worth over $135,000 – to win 10 Years of Travel, a super sweet Tesla Model X, or take $105,000 cash instead. Choose your dream home in South Surrey, a Vancouver sub-penthouse condo, an Okanagan panoramic paradise in Lake Country, a breathtaking Skaha Hills home in Penticton, or an oceanview cottage in SookePoint. OR take $2.1 million cash – and become a multi-millionaire instantly! *Remember, when you order your tickets today, you’re entered into the Summer Escape Draw, the Early Bird Draw, and the Grand Prize Draw. This year’s biggest Grand Prize package is worth a whopping $2.6 million! And don’t forget about BC’s biggest 50/50 draw – the jackpot is already over $1,015,000 and it’s getting bigger every day! It could grow to $2.2 million, and the winner takes half. Now it’s your turn to be there for them! It’s a Win-Win: You’re playing to win over 3,100 prizes – worth over $3.23 million. But you’re also playing to help save lives right here in British Columbia, to support those who need our help. 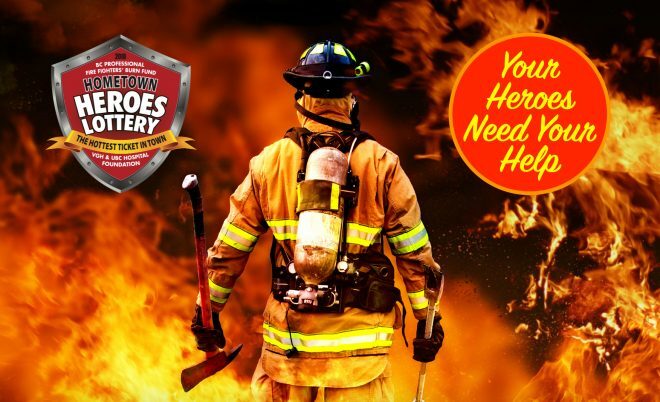 When your purchase a Hometown Heroes Lottery ticket, you’re raising crucial funds for VGH & UBC Hospital Foundation and the BC Professional Fire Fighters’ Burn Fund. Every ticket changes a life.